Three Stagecoach North East bus routes had been updated with free WiFi and more frequent routes. 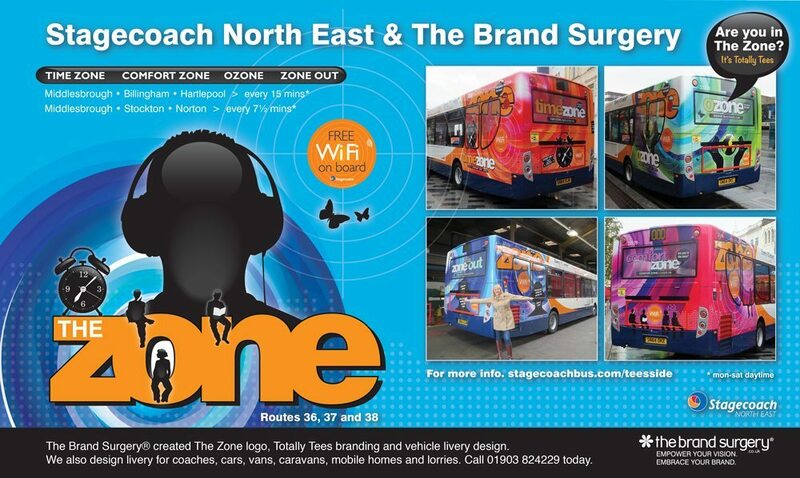 Stagecoach North East commissioned The Brand Surgery to create an exciting fleet of bus livery for the Teesside area. We were advised that Teesside often gets left out when mentioning the North East, so we developed a ‘Totally Tees’ slogan. The client had already decided she would like to use the Brand name ‘The Zone™’ and wanted to use the word ‘zone’ within different sub-brands. ‘ComfortZone™’ and ‘ZoneOut™’ had already been provided by the client, and we created ‘Ozone™’ and ‘TimeZone™’. As with all our logo design, branding and business marketing projects, we carried out extensive market research. Who would be using the buses? What message would the customer respond to? The Zone™ would be travelling past various colleges and universities so we opted for a ‘fun and funky’ approach. First off, we designed a logo for The Zone™ and as standard practice, we provided a choice for our client to chose from. The Zone conjures up futuristic feeling, however we felt the futuristic fonts were too comlex with the design livery design, so we used ‘Swiss 721 Heavy’, and used our artistic licence to tailor the font to meet the brief. We used the Stagecoach ‘brand’ orange throughout the project to align the buses with the Stagecoach branding. We created silhouette elements with a 3D effect to reflect the four sub-brands. For ComfortZone™ we created people doing things that you can’t do, or shouldn’t do, if you are driving such as phoning, listening to music via earphone and reading books. For the TimeZone™ sub-brand we created a silhouette alarm clock, for ZoneOut™ we created a silhouette of someone listening to earphones and for Ozone™ we created a silhouette of hands cupping a planet with some butterflies. We created a glass-3D effect to add depth to the silhouettes. Once the concept had been agreed we applied it to the bus templates. As you can see there are many ‘joins’ and ‘unsafe’ areas to avoid on the bus and everything is printed at a huge scale so it is essential to use high resolution or vector images which magnify without losing quality. Photos can also look stunning when enlarged – think about the Sky van livery with cartoon characters. When designing vehicle livery, it is essential to be able to visualise patterns in 3D. The back of the Enviro 300 buses are curved so creating artwork that joins seamlessly on the curves is challenging. We also created Adshel posters and promotional launch products for The Zone™. Promotional products included branded earphones for ZoneOut™, Eyemask for ComfortZone™, Mints for Ozone™, USB sticks for TimeZone™ and screen wipes for all four sub-brands. We also created a pre-launch and post-launch Facebook campaign, plus The Zone website banners for the Stagecoach Teesside website. Vehicle advertising works 24 hours a day and after the initial cost of design and print, it is free until the design is changed. The most important thing is to create a stunning visual brand identity. We love vehicle wraps because the only limit is imagination. Vehicle wraps allow your brand to stand out from the rest. If you can’t afford an entire brand wrap, a part wrap as on the Zone is a cost effective alternative. We also designed the Pulse bus rear livery earlier this year and you can see our other vehicle livery work by clicking here. As you may have guessed, distance is no problem. We work with all types of businesses throughout the UK and in Canada. 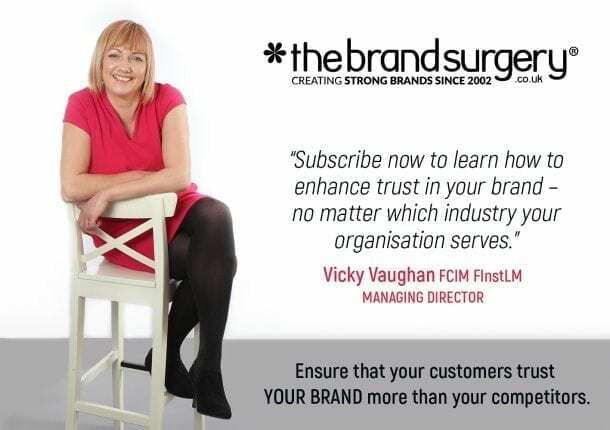 If you need a visual brand created for a new product or business, contact The Brand Surgery, Sussex’s No 1 branding agency on 01903 824229 or email vicky@thebrandsurgery.co.uk.